The Real Alcazar (Royal Palace) in Seville. PA Photo/Anibal Trejo/Turismo de Sevilla. The Plaza de Espana in Seville. PA Photo/Anibal Trejo/Turismo de Sevilla. The world's largest wooden structure, the Metropol Parasol (Las Setas) in Seville. PA Photo/Anibal Trejo/Turismo de Sevilla. Interior of La Azotea restaurant in Seville. PA Photo/Turismo de Sevilla/La Pinza. Betis Street in the Triana neighbourhood. PA Photo/Anibal Trejo/Turismo de Sevilla. The Hotel Alfonso XIII in Seville, built in 1929. PA Photo/Turismo de Sevilla. The tomb of Christopher Columbus in Seville Cathedral. PA Photo/Laura Paterson. 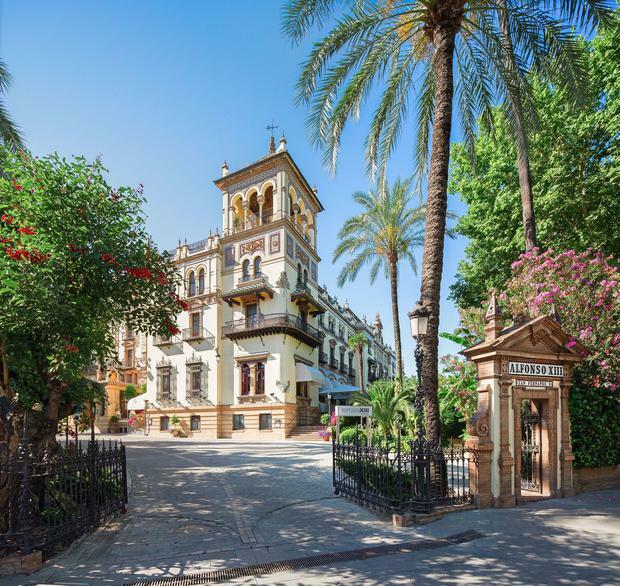 La Quinta Braseria is in a former mansion house in Seville. 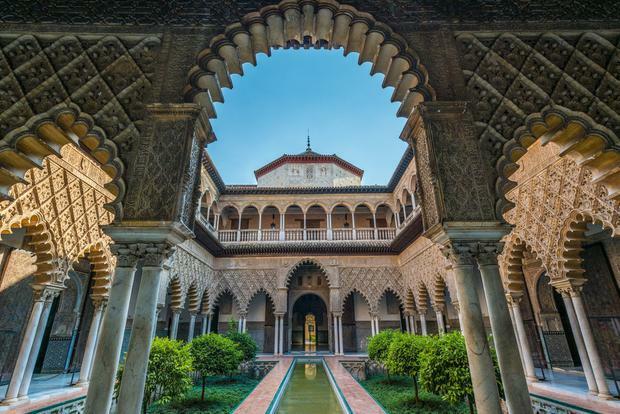 PA Photo/Javier Orive/Turismo de Sevilla). Museo del Baile Flamenco in Seville. PA Photo/Anibal Trejo/Turismo de Sevilla. Having taken six attempts to pass my driving test, letting me loose on a Segway near main roads in a European city is perhaps ill-advised. But speeding around on two wheels proves to be a novel way to see the sights in the Andalusian capital Seville, in the south of Spain. In fact, many of the city's historic landmarks pop up in films, with the five-star Alfonso XIII Hotel - which counts royals including Princess Diana amongst its former guests - appearing in 1962 epic Lawrence Of Arabia, and hit Netflix series The Crown. Elsewhere, the orange groves, peaceful pools and idyllic gardens of the Real Alcazar double up as the Kingdom of Dorne in Game Of Thrones. Home to the Royal family since the 10th Century, this World Heritage Site was partially built by a Christian king at a time of harmony amongst Christian, Jewish and Muslim people; quotations from the Koran mix with Christian symbols in the beautiful mosaics. Our Segway tour ends near the Plaza Nueva, a palm-shaded square filled with the scent of jasmine. It's almost in sight of Seville Cathedral, the third largest church in the world and home to a tomb of Christopher Columbus, containing just 150g of his body. Even more bizarre is a wooden crocodile hanging outside the cathedral; it's a replica of the live animal sent by an Egyptian sultan in a bid to woo a princess in the 13th century. After failing to win her heart, it was strung up after living out its days in the palace. We finish our journey at the city hall, where a meeting with the mayor reveals another Hollywood actor may currently be filming in town. Sadly, I fail to set eyes on Javier Bardem, but I've already clocked up enough A-list sights to fill more than just one blockbuster. It's probably worth visiting Seville just to eat here. Based in an Andalusian mansion house, the restaurant offers modern twists on local specialities, with highlights including croquettes filled with local cheese, Iberico ham and prawns, and Iberico pork cheeks slow-cooked and served with a rich and sweet Pedro Ximenez sherry glaze. Mains from €10.50; glass of wine from €3. Visit grupopanot.com. 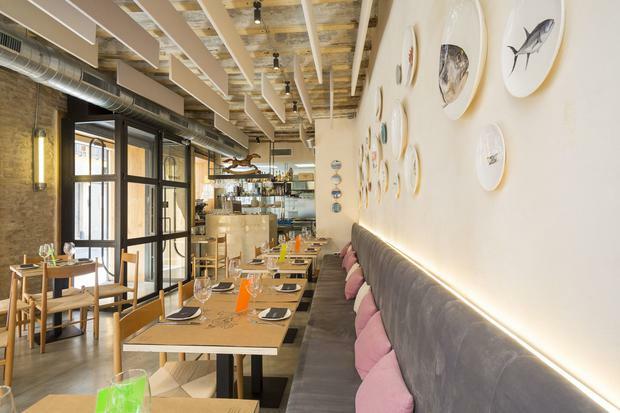 Buzzy but relaxed, this modern restaurant (above) has a mix of tapas and larger dishes, all with an emphasis on fresh produce; staff routinely present fish to diners for approval before cooking. Go for the Spanish tomatoes with tuna belly, followed by a dessert made from local oranges. Tapas from €4; beer from €1.60. Visit laazoteasevilla.com/en/. 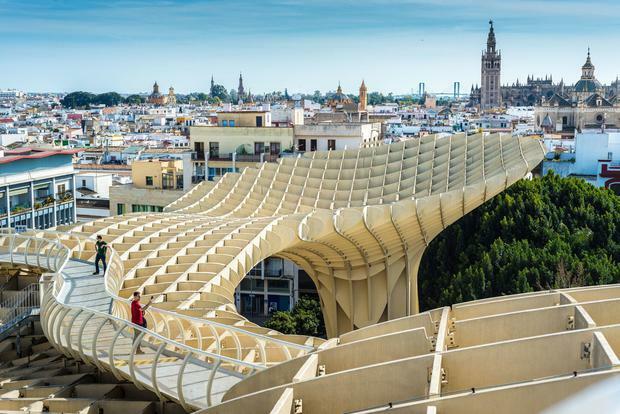 The world's largest wooden structure (above) is a futuristic vision among the shops and cafes of Seville city centre. It's officially known as Metropol Parasol, although most people refer to it fondly as Las Setas (the mushrooms). 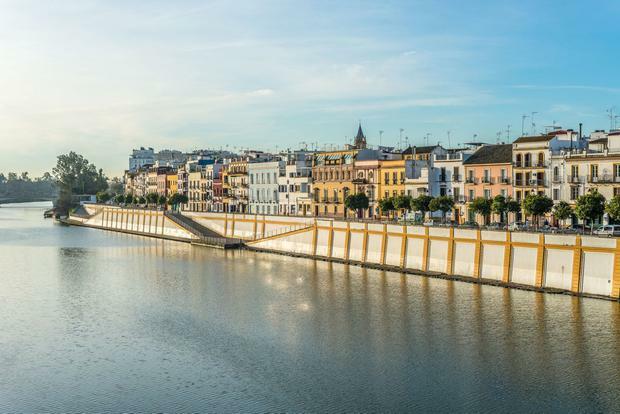 Walking on top of the 28.5m-high sculpture offers great views across the city, while below, the Antiquarium archaeological museum reveals the history of Seville. Las Setas entry €3; Antiquarium entry €2. Visit setasdesevilla.com and antiquarium.icas-sevilla.org. Shaped by various cultures passing through Andalucia over the past 3,000 years, and used to commemorate persecution of minorities, flamenco is the heart and soul of Seville. Castanets came from the ancient Phoenicians, guitars were brought over from the Middle East, and hand gestures owe their origin to the Roma gypsies making their centuries-long journey from India to Europe. Learning the complex steps and hand movements reputedly takes 10,000 hours to master, so those hoping to appear on Strictly after one lesson can think again. Instead, go and watch a show. Museo del Baile Flamenco, the world's only flamenco museum, has a nightly performance. Combined entry adult ticket to the museum and show, €26. Visit museodelbaileflamenco.com/en/. Segways are permitted on Seville's many cycle lanes, making them an ideal means of zipping about and and covering more ground than you would on foot. Cyclotour guides will whisk you around the main sites, stopping regularly to give a local perspective on the city. Segway tours (30 min) from €17.